At any moment, you are either on top of life or life is on top of you. When you are on top of life, you see clearly and can chart your course. You are creative and very effective. You can make things happen and can have your dreams come true. When you experience life as being on top of you, the opposite happens. You become powerless. You lose your confidence and your energy. You become negative and ineffective. When you are in this state, you can’t make anything happen. Any area of your life that isn't working is an area where you have lost your power. That's why it's not working. Fortunately, it is relatively easy to get your power back. To learn how, let's look at the Law of Cause and Effect. At any moment, you are totally, 100% at the effect of the world around you. No matter what happens, you will react accordingly. You are hopelessly at the effect. At the same time, the world around you is totally, 100% at the effect of you. No matter what you do or don't do, the world around you will react to you. This makes you the cause. You are totally at the effect of everything around you. You are also the cause. You are both "cause" and "effect" at the same time. You react to the world around you and the world reacts to you. Although you are both "cause" and "effect," you only experience yourself as being one or the other. How you experience yourself at any moment determines both the quality of your life and your effectiveness. 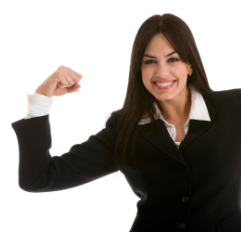 When you are "at cause," you are on top of life and can make things happen. When you are "at the effect," life is on top of you and you can't make anything happen. Any time you are upset or are in the presence of an area of your life that isn't working, you are "at the effect." Notice how painful this is. An example of living "at cause"
Now find a time when you were "at the effect" of something and for some reason, you decided that you had had enough. You reached your limit and decided to take action. You then grabbed your situation by the horns and started handling it. Notice how you felt the moment this happened. Instantly you got your power back. Instead of the circumstances being on top of you, you were on top of your circumstances. You felt good about yourself and good about life. You became confident and full of energy. You also became very effective. You either resolved your situation, or at the very minimum, you got power over it. Without knowing, you shifted from being "at the effect" to being "at cause." You changed your life and you did it with nothing more than a thought. Living at cause is the natural state, but there is something we do that causes us to lose our power. We fight the truth. Any time you are at the effect, there is a circumstance in your life that you are fighting. For example: you don't have enough money to pay the bills or your spouse wants to leave. This area of your life is the way that it is whether you like it or not. When you fight the way your situation is, you give it power. You make yourself a victim and put yourself at the effect. To get your power back, stop the resisting. Surrender to the truth of the way your situation is. Then look to see what needs to be done based on the facts. The moment you do this and start taking action, you get your power back. You shift from being at the effect to being at cause. Solutions show up and this area of life starts clearing up. Look at any area of your life that isn't working and notice the direction of your focus. Instead of looking for what needs to be done based on the truth of the way your situation is, your focus is on fighting the truth. Instead of resolving the problem, you give it power. The key to living "at cause" is simple. Don't stay "at the effect." As soon as you notice that you are "at the effect" of something, stop. Stop being "at the effect" and move to "cause." 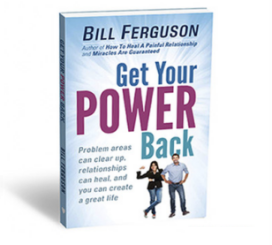 To learn more about how to live "at cause" and have all of your life work, take our video course, subscribe to our free e-course, and read the book, Get Your Power Back. Are you having a difficult time? Would you like to end the conflict, heal the hurt, and restore your inner peace? Would you like to heal your relationship? You can. The best way to do this is to work directly with Bill Ferguson. Give us a call. We can talk about your situation and create a plan of action. You can create a great life, but you have to know how. Both the video course and the free e-course walk you through the steps. As you work with the lessons, you change your life.